The Waterpik is great for regular cleaning but it’s also excellent for individuals with crowns, dental implants, braces, and veneers. While other similar products on the market are only appropriate for teeth in their most natural and untapped state, the Waterpik is much more versatile and multipurpose. Although the majority of us brush our teeth on a daily basis, many of us only tend to floss every once in a while or never at all. With gingivitis and gum infection becoming increasingly common, you might be wondering if there is a preventative measure (besides flossing) that one can take. Flossing can sometimes be a time consuming and painful process, but the Waterpik WP-660UK allows you to keep your gums healthy and improve overall oral health in a quick and efficient manner. This product is an electric water flossing unit which uses pressure and pulsations to push water between your teeth and gums. The Waterpik WP-660UK is clinically proven to be up to 50% more effective at improving gum health over regular flossing. It also removes up to 99.9% of plaque in just three seconds and it not only removes bacteria from deep regions of your gums, but it massages your gums and improves circulation. Another excellent feature is that it comes with a high voltage DC motor which more environmentally sustainable since it consumes 56% less power. If for whatever reason you are unsatisfied with this product, your purchase comes with a 2-year warranty. This water pick is an easy to use – handheld device which works perfectly for individuals with braces, periodontal pockets, crowns and other types of cosmetic dental work. You simply switch it on with the touch of a button and begin cleaning. The Waterpik comes with a pressure control button which allows you to select the perfect cleaning setting and it also comes with a 1 minute timer and a pacer to help you clean your teeth in record time. Along with 10 water pressure settings, you also have 7 tips for different cleaning purposes such as general brushing, plaque removal, and deep cleaning. 1 plaque seeker tip which helps clean hard to reach areas. 1 orthodontic tip designed for cleaning braces. 1 pik pocket tip for periodontal pockets and furcations. 1 toothbrush tip for simultaneous brushing and flossing. 3 classic jet tips for general flossing. A 650 ml water reserve. A two pin plug perfect for UK power sockets. This product is 50% more effective at improving gum health than regular flossing. It only takes 1 minute to clean your entire mouth with this device. Offers professional grade dental cleaning in the comfort of your home. You will save money and several trips to the dentist’s office every year. Although it features 7 floss heads, most individuals will only use 1-2 of them on a regular basis. The floss heads are water proof but the entire device is not. For those with dental implants, it’s good to know that the Waterpik was found to be two times more effective than regular flossing and it effectively reduced gum bleeding in dental implant patients. The Waterpik has even gone through clinical trials where it was discovered to be up to three times more effective than flossing. It can even be used with mouth wash and various temperatures of water to deliver an even deeper level of cleaning. 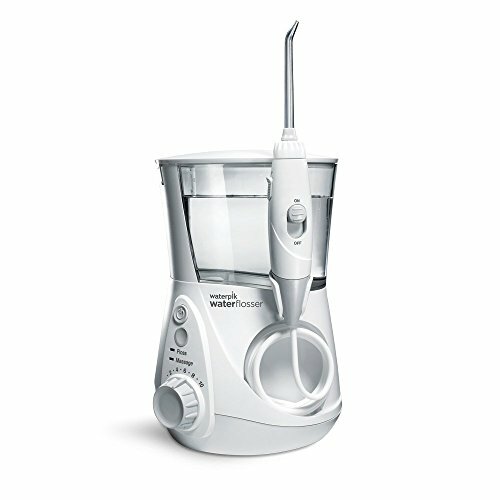 Whether your goal is to prevent oral health issues or heal any per-existing conditions, the Waterpik WP-660UK is an excellent product to use. I have personally used this device and I found that it not only cleans the areas between my teeth in a matter of seconds, but it’s very easy to use. Even young children can easily use this product (with adult supervision, of course) and it’s something that the whole family can benefit from. My gingivitis has completely gone away thanks to the Waterpik which is something both myself and my dentist are very happy about. With oral health risks increasing on a yearly basis in the UK, you owe it to yourself to invest in a product that will help prevent potentially serious issues with your gums and teeth.